Often an automaton figure without jointed arms and legs will work just fine. But, if you want to create a character pedaling a bicycle, those knees will need to bend! To depict a realistic human motion, it is helpful if the figure’s joints only bend the way real humans bend. 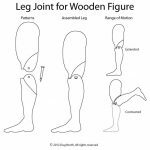 Joints that only move in the correct way give you more options for providing the necessary input motion also. This, in turn, creates a greater range of resulting motions from which to choose. 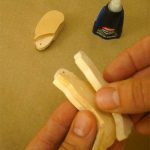 In this article, we will create a basic wooden knee joint that is easy to make and has dozens of uses. This project requires some thin pieces of wood and a few hand tools. 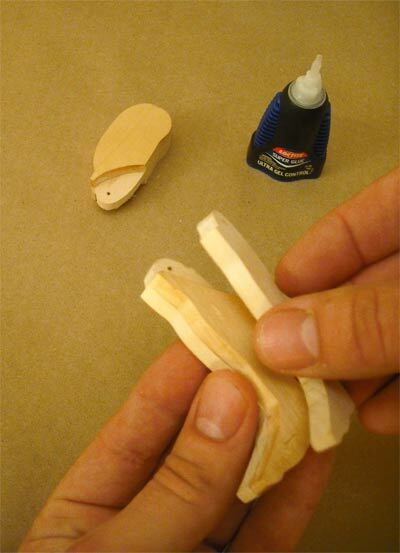 Glue — I used Super Glue, but any glue suitable for wood is fine. 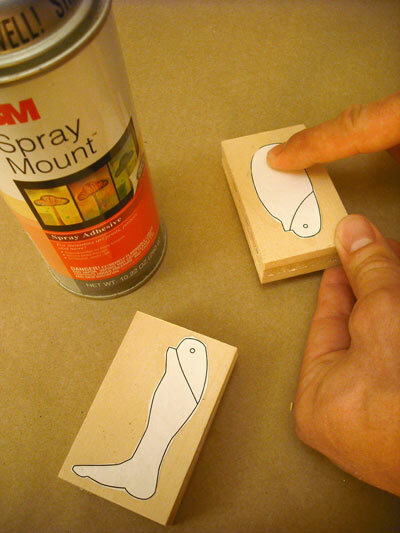 Print the pattern out on plain white paper. 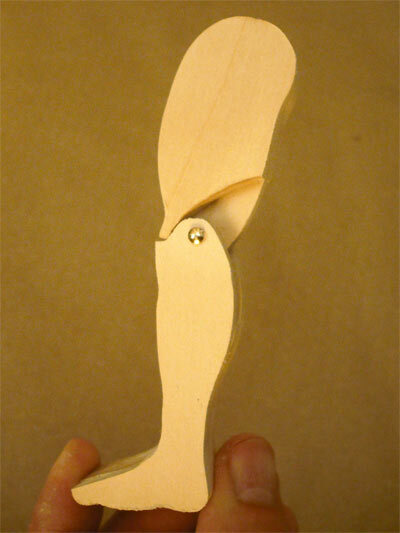 My finished leg measures 4 3/4″ tall (about 12 cm). You may have to set your printer to scale the image up to get the pattern to print at this size. 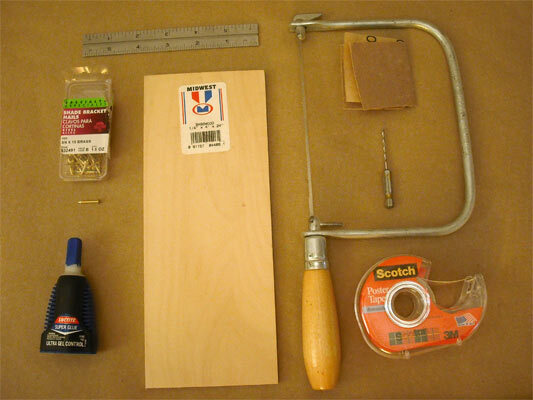 Cut six pieces of 1/4″ thick basswood sheet into rectangles measuring 3 1/4″ by 2″ (about 8.5 cm by 5 cm). Using thin double-sided tape, create two stacks of three rectangles each. The stacks allow you to cut several pieces of wood at once, saving time and helping to ensure that parts are identical. Once you have two three-layer stacks, glue the upper leg pattern to one and the lower leg pattern to the other. I used spray adhesive. You could also use carbon paper to transfer the pattern to the wood. For both upper and lower leg pieces, use a 5/64″ (about 2mm) drill bit to drill all the way through both stacks. The holes are for the brad that holds the leg together and serves as a hinge pin. Cutting the parts is done in two stages. 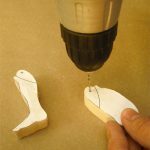 Staying close to the line, cut around the outermost black line of both the upper and lower leg pieces with a coping saw or scroll saw. Once the two stacks have been cut to the outer line, you need to remove some pieces from the stacks. For the upper leg, pull only the bottom layer of wood off the stack, leaving two layers and the pattern in place. For the lower leg, remove the bottom two layers, leaving only the top layer with its pattern. Set the pieces without the patterns aside. Cut the interior lines shown on the patterns. In both cases you will be cutting off the section with the drilled hole. Carefully pry all of the pieces apart and remove the paper pattern. A hair drier or heat gun can be used to soften the adhesives to make this task easier. Clean up any rough edges with sandpaper. For the upper leg, the largest uncut piece with the drilled hole will be sandwiched between the two smaller pieces. 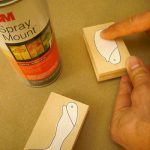 Apply glue to the flat surfaces and glue the three pieces together. Use the flat, square area near the knee to align the pieces. To create the slot in the lower leg, the smallest piece will be sandwiched between the two larger ones. Once again, glue the pieces together using the flat area near the knee to properly align the pieces. 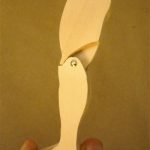 Once the glue has dried, insert the thin part sticking out of the upper leg into the slot in the lower leg. From the side, look through the drilled holes and line them up so that you can see light through both pieces. 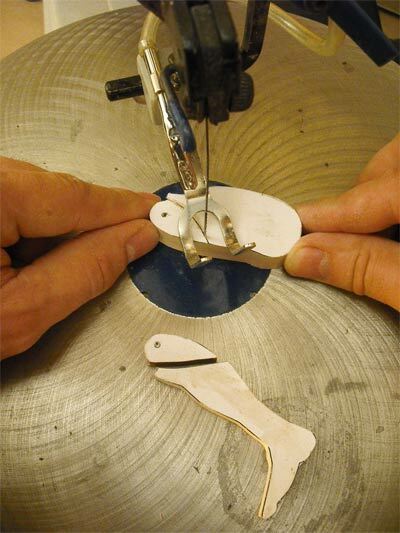 Next, press the brad into one of the lower leg holes, through the upper leg, and out the other side of the lower leg. Slowly try bending the knee. If you followed the pattern carefully, it should bend through a full range of motion. If you feel any resistance, don’t force it! Notice where the joint will move freely and slowly move it towards the point of resistance. When you feel resistance note where one leg part is making contact with the other. Bear in mind, it might be making contact in an area that is hard to see, such as within the slot in the lower leg. Most often, the problem is located somewhere along the circular contour surrounding the drilled pivot holes. Mark the contact points with a pencil. Disassemble the leg, and sand the marked spots to create the necessary space. Repeat this process until the leg can move through a full range of motion. A drop of glue directly under the head of the brad will keep it from slipping out. 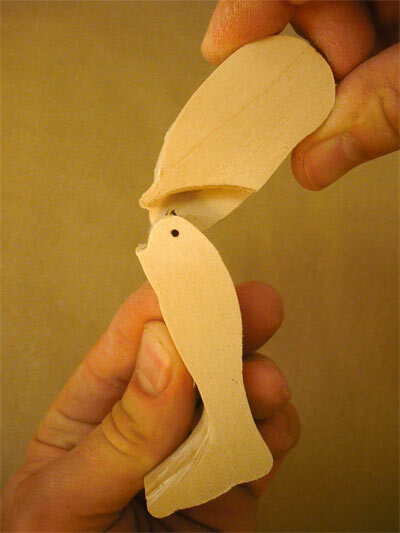 You’ve created a wooden joint that mimics the motion of a human knee! This style of joint is suitable for human — not to mention robot, alien, animal, and monster — elbow joints as well. You may have noticed that the lower portion of the leg looks rather thick and chunky. 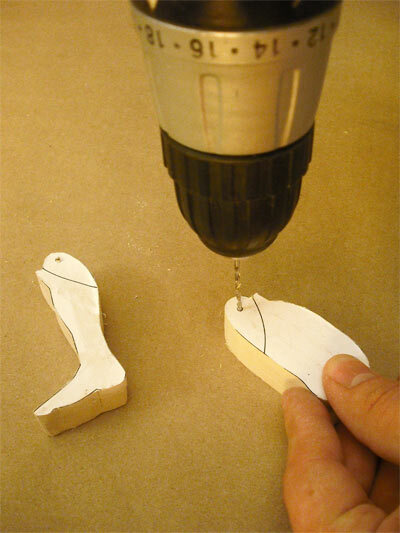 Because it is made of basswood, you can saw or carve the leg to a more realistic shape. You can also modify the pattern if your character is wearing pants and shoes. 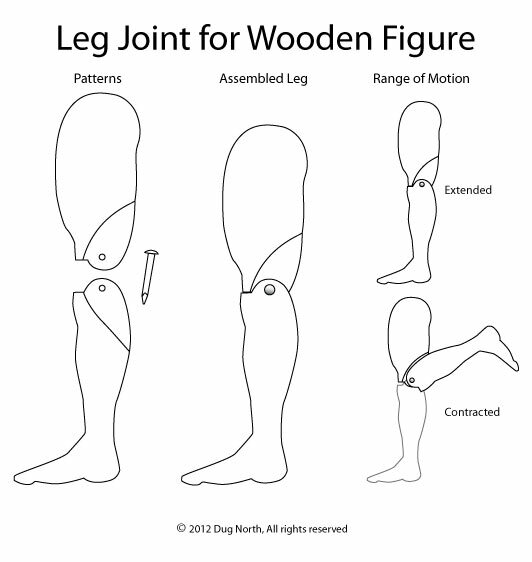 For further inspiration, study the joints used on plastic action-figure toys — especially those representing athletes. Some of these toys make accurate and inexpensive anatomical reference models! For a list of materials and further reading visit Dug’s Tools and References page. A well done tutorial on the making of a bending knee. What I find interesting is that you must place a disclaimer/warning at the bottom of you blog in order to protect yourself against some frivolous lawsuit from an ambulance chasing lawyer. I was given a pen knife when I was seven years old that I even took to school along with the rest of my classmates. “Mumbly-peg” was a recess past time. Once I learned which end of the knife was sharp, I never had to relearn the lesson ! What a sad comment on a society becoming even more ignorant and politically correct ! Excellent! Thank you, I’ve been carving jointed legs out of solid stock and never could get the range I wanted. This makes much more sense! Cheers! Thanks, I was just looking through an old marionette-making book trying to figure this out. That works too! It is more work. If the wood will be left unfinished, cutting a mortise and tenon can be preferable because there won’t be any tell-tale glue lines in the wood. Glad you found the tip helpful! Glad you liked the article, Sharon! Old marionette-making books are a great source of information! Thank you so much for sharing your knowledge with our group of enthusiasts. I am growing my gourds and plan to use some of them to make automata. 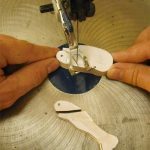 This blog was very helpful to me in making movable joints. Again, thank you – T.R. We’re very glad to hear that the Tips column has proved to be helpful. The gourd-based automaton is sure to be interesting! 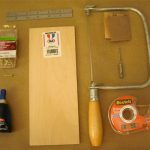 Any tips on creating miniature mortise and tenons? Particularly on pieces that don’t have any flat sides? Or maybe you cut the mortise and tenon before carving the overall shape of the piece…? I like your idea of cutting them ahead of time. That’s a great approach. Beyond that…think small. The process doesn’t change much from the full-size version, just the scale of the tools. If I am cutting very small mortise and tenons, I use small tools. I have some very fine saws that fit in a hobby knife handle. I also have a set of micro-carving tools made by Dockyard. Likewise, I use small drill bits in a pin vise. Having a good way to hold the pieces while cutting them is very helpful. I often use a jeweler’s hand vise to hold small objects. Don’t underestimate the value of magnification. If you can truly see what you are doing, things become much more manageable. I’m hope I’ve answered your question! What on earth is a ‘brad’?! Is this a special kind of nail?